All of us smiling, standing in a field brushed with sunlight, and dressed to the nines in a color-coordinating palette of blues and oranges. There is a dramatic lack of yoga pants and mis-matched toddler socks here, along with way too much grooming. And, can I tell you a secret? The only reason my girls are smiling is that our wonderful photographer was cracking poop jokes from behind her lens, on my suggestion (I’ll take my Mom of the Year Award now, thanks). But despite the surreal nature of the shots Shannon caught last weekend, I disagree that they fail to capture our family. While we may not always look just like this, it’s a perfect depiction of how I feel inside. My girls? They fill my life with light. And though the mundane tasks of the day and sibling squabbles dominate my schedule, there is a contentment in my family that I rarely get the chance to capture. The closer I look at our portrait, the more I see that Shannon photographed each of our personalities perfectly. My shy, snuggly Bean and her comedian older sister. My husband, with his arms wrapped around every one of us, the backbone of our family. And me, with a genuinely happy and relaxed smile. Manufactured? Staged? Maybe. But not one less bit real. If you are in the Boston area, Shannon (who is uber-talented) is running an unbelievably amazing summer special for $149! If that wasn’t enough, she loves Warrior Moms. Creative Images Boston will donate $15 for each session that mentions Postpartum Progress! Disclaimer: I received nothing in return for my post or sharing of Shannon’s summer special. My post was completely unsolicited. I just adore her and her work and love to help out a fellow mama. Shannon, you’re amazing and I’m so grateful to you for capturing my family so perfectly. I seethe with jealousy when I see people’s gorgeous designer agendas, but every time I’ve committed to treating myself to one, I can’t seem to find just what I want. There are always pages I know I’ll never use, and the calendars are never laid out the same way my brain works. I was the same way with lesson planning back in my public school teaching days. The standard lesson planning books bought at the local teacher store never quite fit the bill, so I always printed up my own. And yes, I know technology is wonderful and I could use some combination of iCal, gmail, and some family calendar app to sync everyone and everything together, but it always seems like so much more work to unlock my phone, open the app, and thumb-type in my appointments. Add in the additional 10 minutes I will inevitably spend checking email, FaceBook, and text messages upon unlocking my phone, and what should have been a 2 second job has now taken 300 times as long (no, really, I did the math). Compared with jotting down a note on paper, there are just too many steps involved for it to be practical for me. So I Frankensteined together my own agenda book, using a 1″ binder and some dividers I had in my old teaching supplies. I use the “Weekly Family Calendar” from Mommy Tracked, and print about 8 weeks at a time, filling out the dates far in advance of needing them. I have sections for Doodlebug’s school information, my piano studio, and plastic zipper pockets for things like checks, receipts, and notes. A threadbare sticky note marks the current week and the binder often stays open during the day so I can check off appointments and tasks as they are accomplished (in my head, I say, “Boom!” every time I check something off. It’s like my own little celebration). That’s right. I can order my groceries on my tablet and then pick them up at the store’s drive-through. It’s like I have 2 hours of my life back, every single week. And while I pay a smidge more for the convenience, it’s well worth the time I get back. I still end up with a once-weekly Whole Foods trip for our meats and produce, but that’s a quick 10-minute visit after preschool drop-off. I also think we spend less because our food shopping for the week is planned out and there are no gratuitous impulse buys (my DH is the worst about this). I think my favorite thing about using a pen-and-paper system is the satisfaction of seeing, at a single glance, everything I have accomplished during the week. You don’t get the same feeling with computerized calendars. And as a stay-at-home-mom (who dabbles in several small home businesses and volunteer jobs), that kind of validation is hugely uplifting. Maybe when they’re older, my kids will think I’m old-fashioned, with my ink-filled writing device and wood-based single-use tablet, but I’m getting old enough not to care. That’s the consolation prize for getting older, isn’t it? Do you have an agenda or calendar system you love? How do you keep track of the chaos? Drink Your Beer From A Robot Glass… On My Dime! I haven’t ever hosted a giveaway before and don’t intend to hold many more, but when I saw this in person, I had to share. I am lucky to have wonderful in-laws. And my sister-in-law, Heidi, is no exception. She’s passionate about style and graphic design, and has a great eye for vintage finds. And she’s always making gifts for everyone. One year, for No1’s birthday, she made two felt boards with pockets sewn on the back for all the felt pieces. And when my oldest was born, she made two newborn outfits, by hand. Last year for Christmas, she sewed an adorable, zippered smartphone bag and filled it with goodies from Bath and Bodyworks. I keep it with me all the time. I just love handmade gifts. They not only say I know you and what you like but also I spent time on this just for you. This year for my husband’s birthday she sent these hand-designed and etched pint glasses. While the were a gift for Hubs, I fell in love with them. Their simplicity and whimsicality are just lovely. And just because I adore them and you, I’m giving away a pair! They could make the perfect gift for the nerd in your life! 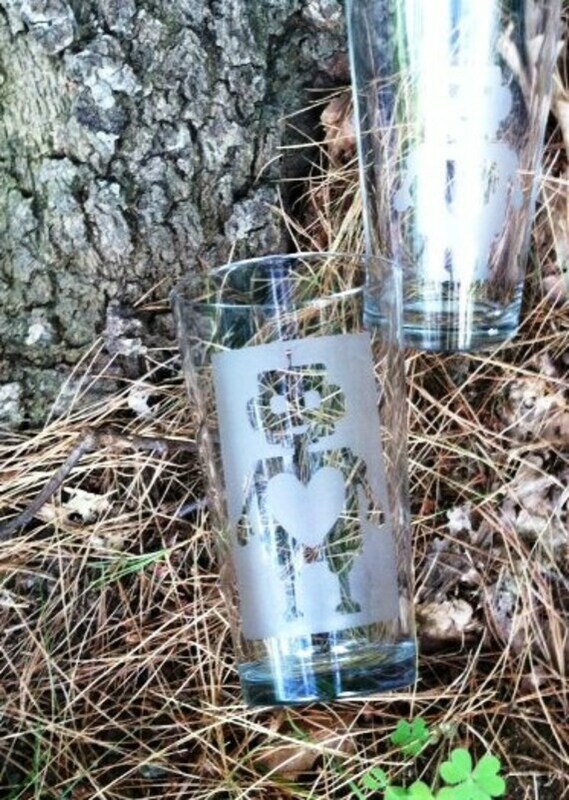 To win your very own set of robot pint glasses, head on over to Heidi’s shop, Chic Squirrel Designs. Then come back and tell me what your favorite item is in the comments. She just moved to a new house, so the listings are short, but she’s hoping to add more items soon, and she’s always up for new ideas. Entries will be accepted until Friday, November 16th at 2pm. I’ll draw one comment using random.org and notify the lucky reader by email. Be sure to leave your real email address with your comment so I can get a hold of you! And because Heidi’s so amazing, she’s giving all of my readers a coupon code good for 20% off anything in her store! Just use the code HAPPINESS20 at checkout. WINNER WAS COMMENT #2, CONGRATULATIONS, TONI! We are very fortunate that the hurricane has brought only power loss and a bit of rain our way. I take comfort in the fact that our house is up on a hill, in an elevated area of town. Still, severe weather is a huge trigger for my anxiety. This is how my husband is helping battle it. Forgive me if the YouTube like doesn’t play in this window. I’m blogging from my phone. Hoping you are staying safe if you’re in Sandy’s path. If you’ve never taken a preschooler bowling, let me be the first to suggest it. What a riot! The moment No1 put on tiny bowling shoes, I knew my $26 was money well-spent. She would *not* put the bowling ball down while waiting for her turn. It took a good 45-60 seconds for the ball to reach the pins each time. She threw a 6 pound ball. So adorable. I won, by the way. With a score of 98. And that’s WITH the bumpers in place.